Photo of the day: GENTRIFICATION IN PROGRESS GENTRIFICATION IN PROGRESS – Daylight savings time greeted Long Island City this morning with a surprise. 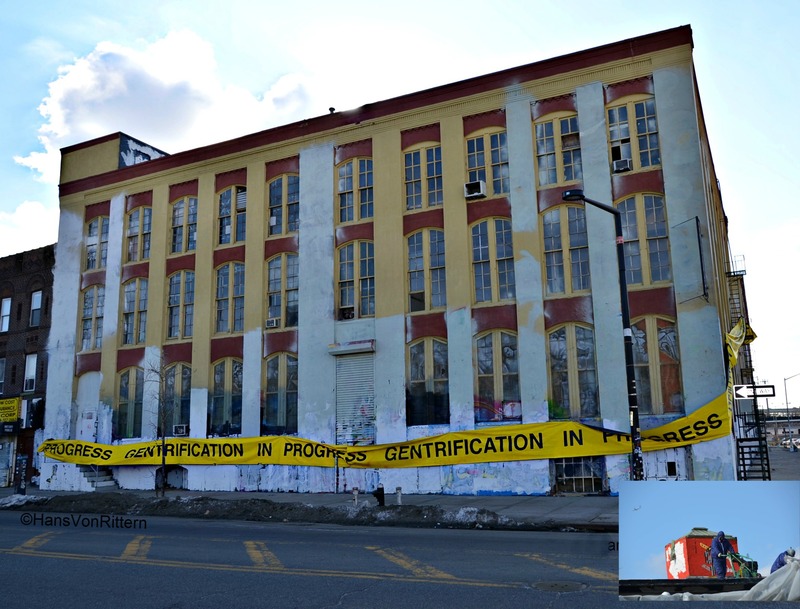 5 Pointz has been gift wrapped by the artists gilf! and BAMN (By Any Means Necessary) who collaborated on the banner making for the lobotomized zombies that will one day move into the glass towers that will replace the greatest street art museum on earth. Even as I was photographing it at sunrise this morning, the workers were on the roof doing ‘asbestos abatement’, ripping the roof apart as the dust particles flew everywhere, irritating my throat as I photographed. This is gentrification? This is destruction. Art is stronger, we will succeed. So long as we have art that makes us gasp. Just as long as we have we. Heart to heart and hand in hand. Photo of the day: And they’ll blow their floofloovers, They’ll bang their tartookas !
. . . And then! Oh, the noise! Oh, the noise! Noise! Noise! Noise! There’s one thing I hate! All the NOISE! NOISE! NOISE! NOISE! And they’ll shriek squeaks and squeals, racing ’round on their wheels. They’ll dance with jingtinglers tied onto their heels. They’ll blow their floofloovers. They’ll bang their tartookas. They’ll blow their whohoopers. They’ll bang their gardookas. They’ll spin their trumtookas. They’ll slam their slooslunkas. They’ll beat their blumbloopas. They’ll wham their whowonkas. And they’ll play noisy games like zoozittacarzay, A roller-skate type of lacrosse and croquet! On their great big electro whocarnio flooks! BUT ~ then the Grinch puzzled and puzzed till his puzzler was sore. Then the Grinch thought of something he hadn’t before.